Chris Boiling is a winemaker and wine and travel writer. You can find his work at JancisRobinson.com, VinCE magazine and of course WTM, where he wants to share his passion for the wines and wine regions of Central and Eastern Europe. ’Tis the season to drink warm, spicy wine. Normally I like my white wines served at around 46-51°F and my reds at 59-64°F There are exceptions, of course. I’ve had some lovely chilled reds in warm countries such as Portugal. The other big exception I make is when strolling the cobbled streets of one of Europe’s great cities during a Christmas market. I don’t care about the wooden toys, woolen slippers, lucky garden pixies, or bear-shaped incense smokers. I go for the mulled wine. I know these drinks are usually made with the cheapest wine and I’m usually against adding things – even sulphites – but, hey, it’s Christmas. If you can’t drink wine with cloves and cinnamon sticks in them now, when can you? Ever wonder who was the first to drink mulled wine, or ‘glühwein’ as they call it in Germany? Well, according to the great-sounding Schloss Wackerbarth winery, Saxony's oldest sparkling wine manufacturer, the recipe dates back to December 1834. August Raugraf of Wackerbarth was standing in the baroque castle at Schloss Wackerbarth and feeling the cold. So he started looking for a special drink to make the cold disappear and to warm his “body and heart”. He mixed saffron, anise and pomegranate into white wine and heated it up. But, after his death, the recipe went missing and soon people forgot about it. However, at the end of 2013, the historical recipe was rediscovered in the Saxon Central State Archive in Dresden by Dr Nils Brübach and employees of Schloss Wackerbarth set about adapting it for modern palates. But, just like the original, it features selected white wines from Saxony, grape juice and “gentle flavoring ingredients”. It’s sweet and fruity and it’s called “Wackerbarths Weiß & Heiß” (Wackerbarth’s White & Hot). Christmas at Liseberg Amusement Park | Photo Credit: Sagoslottet/Göteborg & Co. The main attraction in Gothenburg is the 3km ‘Lane of Lights’ that leads from the harbor down the main boulevard (Avenyn) to the Liseberg amusement park. At Liseberg you will find Sweden’s largest Christmas market with more than 80 stalls and small shops, an ice skating rink, and a Christmas buffet in the restaurants. The park is decorated with around five million lights and there are some real reindeer for children to see. Along the way to Liseberg there are shops and restaurants, also offering special Christmas buffets and glögg – that’s what they call mulled wine here. But the best place to drink glögg – which may be spiced with cinnamon, apple, and brandy – is on the sightseeing boat to Liseberg. It leaves from Kungsportsplatsen and carries candles and blankets, as well as mulled wine. The city also has several other Christmas markets in some of its best historic sites, including the castle, the cobblestone streets of Haga Nygata in the Old Quarter, the former boiler house at the entrance of the harbor (now the Röda Sten Art Centre), and in Gothenburg's oldest building, Kronhuset. The beautiful Gunnebo House and gardens, just south of the city, also host a market with handicraft stalls and organic cuisine. In the center of the city – even if you haven’t had any glögg – you will see a singing Christmas tree at the statue Kopparmärra, in Kungsportsplatsen. It’s actually a choir standing in the shape of a tree, but don’t tell that to the glögg drinkers. A small singing tree (with younger choir members) will perform in different places in the city centre until December 23. Germany is Christmas market central. Cologne, Hamburg, Worms, Leipzig, Nuremberg, and Stuttgart all have great festive markets but it’s hard to beat sipping mulled wine in the historical setting of the Gendarmenmarkt, buying gifts at the wide range of stores on the beautifully lit Kurfürstendamm, or cross-country skiing on the 5000 meter track at the former Tempelhof Airport. There are actually about 60 Christmas markets in Berlin, all starting around November 21 but finishing any time from December 26 to January 1. The main market is the one at Gendarmenmarkt, which finishes on December 31. The Konzerthaus and the French Cathedral are lit up and there is a small tent city between them selling exactly what you would expect from a German Christmas market – hand-carved cribs, mouth-blown glassware and replicas of historical steam engines. You can watch the craftspeople at work whilst enjoying your glühwein. Another top place to drink mulled wine is on a BettBike, a rickshaw with a bed that carries passengers instead of seats. Nicely tucked in, you get to enjoy mulled wine and gingerbread in front of Brandenburg Gate without tiring your feet. The market at the Rotes Rathaus takes you back in time. There are puppeteers, storytellers and carousels for the children and steaming mead in clay jugs for the adults. At the Potsdamer Platz there is Europe’s largest mobile toboggan run, skating and curling. The Lucia Christmas market in the historic Kulturbrauerei building complex has a Scandinavian theme with music from Denmark, Finland, Iceland, Norway, and Sweden, and other traditional things, such as a bungee trampoline and a chairoplane. Christmas Market in Vienna | Photo Credit: Popp G.
We recently stated that Vienna is the best capital city for wine tourism as it is also a wine region. It is also one of the best places for Christmas markets and glühwein. They’ve had a few years to get it right as the tradition of a December market (Krippenmarkt) dates back to 1298. There are about 20 markets in the city but the main ones are those that have impressive historic buildings for backdrops – chiefly the one at the Rathausplatz in front of the neo-Gothic City Hall. It has more than 150 stalls selling wooden houses, puppets, gingerbread hearts, leather clothing and woollen hats. Inside the City Hall, on the ground floor, there is an area where children can learn to make Christmas cookies or candles. You can also listen to international choirs singing carols there. The nearby Rathauspark has carousel rides and trees covered in lights. There are also Christmas markets at the glorious Belvedere and Schönbrunn palaces, and also at the Altes AKH (a former hospital) and Maria-Theresien Platz (in the Museum Quarter). One of my favorite places to drink glühwein is in the narrow streets of Spittelberg, a revitalized heritage district behind the Volkstheater. You pay your deposit for a mug at the top, wind your way through stalls selling objects d'art, ceramics, warm jumpers, rugs and jewelry – buying glühwein when you get the urge – and collect your deposit when you return the mug at the end of the lanes. A typical Austrian glühwein mixes red wine, water, cinnamon sticks, sugar, oranges and cloves. What I like about the Budapest Advent and Christmas Fair is the emphasis on food and drink. There is a giant wreath that’s lit and the advent calendar is brought to life in the main Vörösmarty square, but the focal point is the 12,960 square foot terrace built around the Vörösmarty sculpture that is packed with catering pavilions selling ‘kürtőskalács’ pastry, cottage cheese cakes, roasted chestnuts, hand-crafted confectionery, ‘flódni’ cake, traditional poppy-seed roll (beigli), cinnamon fruit compote and honey spiced biscuits. There is music on the main stage, ranging from folk to jazz to soul. And just before you say, ‘What, no White Christmas, I’m not going’, there are smithing demonstrations in a traditional blacksmith’s workshop. Get an iron candelabrum here for that special someone in your life. For children there are music-dance performances, a puppet theater and workshops on candle making, gingerbread baking, stringing beads, felt making and basket weaving. The square is filled with 100 wooden huts selling crocheted items, fur hats and gloves, and ‘lucky garden pixies’. You can see all of these – and people falling over on the ice rink – from the catering terrace while you drink mulled wine or check out the rising quality of Hungarian sparkling wines. The mulled wine here comes in white and red versions. Alsace is a great wine region to visit any time of the year. But going there at this time of year is extra special because its main cities, Colmar and Strasbourg, have great Christmas markets. Colmar, in fact, has five – in different squares linked by illuminations and a labyrinth of small streets. Most of the products for sale come from local producers and the quality is high. The market in la Place Jeanne d’Arc is probably of most interest to wine lovers as the traditional wooden stalls here are dedicated to local produce, such as foie gras, bredalas, Alsatian wines and brandy. The market near the Dominican Church has a more spiritual theme while the one inside the Old Customs House (Koifhus) concentrates on artisans, such as potters, glass blowers, cabinet-makers, wood sculptors, hat makers, and jewellers. Outside, in the beautiful square around the Schwendi Fountain, there are another 40 or so stalls. At Place des Six Montagnes Noires, a market aimed at children, you will find an animated nativity scene, a merry-go-round with wooden horses and a giant French-style yellow letterbox to post your letter to Santa Claus. Strasbourg has 300 stalls spread over 12 locations and a wide-ranging cultural program. Another wine region worth visiting at this time of year is Trentino in northeast Italy, near the border with Austria. It’s known for its classic-method bubbly from producers such as Cantine Ferrari and reds made from Teroldego, Lagrein and Schiava grapes grown in near-vertical vineyards. Most of the picturesque towns and villages have Christmas markets. In Trento, the gateway to the Dolomites, there are about 90 little wooden stalls displaying local foods, wines and crafts in its two main squares, Piazza Fiera and Piazza Cesare Battisti. In Rovereto the focus is on “faraway countries” and the displays include handicrafts from Bethlehem and Belarus, and Hungarian sweets, as well as typical Trentino products, organic gifts and objects from young artists. In Valsugana’s Levico Terme (from November 21) the aim is to take visitors back in time to when the Habsburgs ruled this part of the world. In Arco, the products in the 40 small wooden stalls include cribs, boiled woollen slippers (which are said to be super-warm) and local food and wine. In Riva del Garda, the historic Rocca building has been turned into Father Christmas’ house and the special feature this year is the ‘Mercatino del Gusto’ (market of taste). In the street market set up in the gardens of Cavalese’s Palazzo della Magnifica Comunità the products include woollen slippers, natural cosmetic creams and fruit syrups. November 26 – December 29, 2016. Lithuania’s capital is fairly new to the Christmas market scene with the ‘Kalėdos Sostinėje’ starting in 2012. It fills Cathedral Square (Katedros Aikštė) with 48 wooden stalls. The products for sale are mostly locally made gifts, such as woollen slippers, ceramic candle holders, glass, and jewelry, plus Christmas decorations and festive foods. These include roasted chestnuts, poppy seed cake, gingerbread, artisan breads, and mulled wine (karstas vynas). The recipe of the wine is supposed to be a big secret but it involves red wine, honey and spices. You can drink your wine while gazing up at the 25-metre-high Christmas tree in the square (it’s a metal frame covered in real fir tree branches and oversized baubles) or the equally impressive Vilnius television tower, which is covered in lights for the occasion. In the market square (Torvet) you will find the usual mix of local crafts and local food, charity concerts, children’s entertainment and horse sleigh rides. The local products here, of course, also include dried reindeer meat, moose burgers and beautiful Christmas trees from the woods in Trøndelag. This far north, it can be a bit nippy out so the best place to enjoy the market is from the ‘big lavvu’ (a Sami tepee), where you can sit around an open fire, eat local delicacies and sip on tankards of warm wine. The mulled wine, Aronia, from the local brewery Klostergården, contains red wine, vanilla beans, cloves, star anise and cinnamon sticks. While you sip, you will be entertained by troubadours and folk tales. Every day, local producers of food and beverages are invited to share their stories and knowledge. Make sure you are there during the beautiful blue hour, “den blå timen”. It gives everything outdoors a magical blue glow. Combined with the decorated stalls and thousands of small lights, it is like stepping into a Norwegian fairy tale. 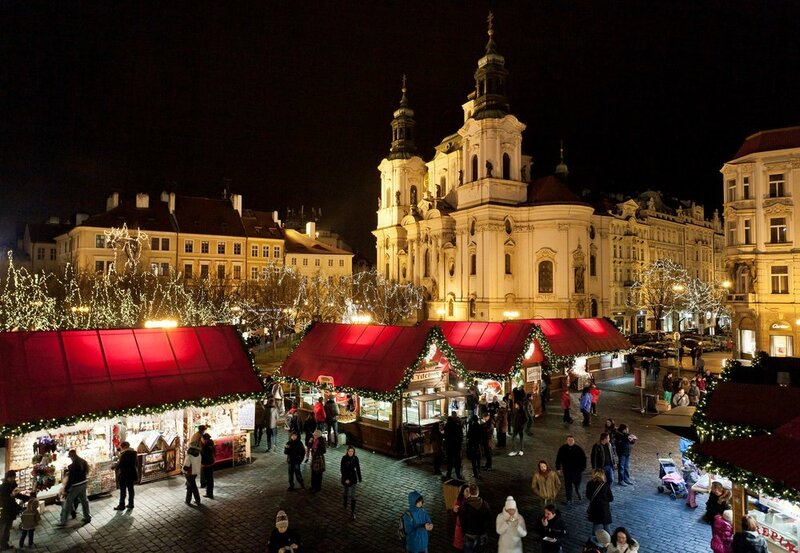 The unmistakeable aroma of mulled wine with cinnamon, clove, star anise and orange or lemon peel will guide you to the Christmas markets in Prague’s Old Town Square (Staromestské námestí) and Wenceslas Square. At both you will find traditional Czech food, such as barbecued pork and trdelník (a crispy pastry topped with sugar, cinnamon and crushed nuts), as well as beer, mulled wine and mead. There are also wood-carved toys and some great glassware, but who cares about that when there is beer, mulled wine and mead?